Peter C. Newman. 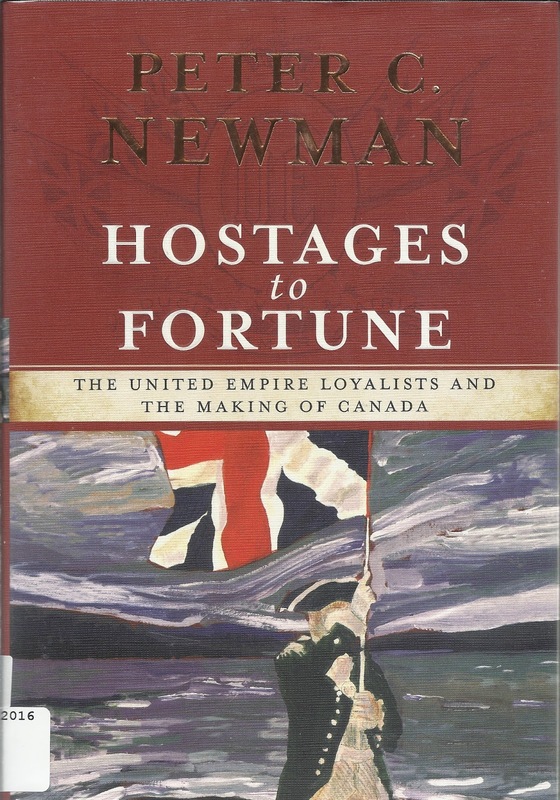 Hostages to Fortune, the United Empire Loyalists and the Making of Canada. Toronto: Simon & Schuster Canada, 2016. ► Quote: "Newman said that hundreds of books have been written on the Loyalists but almost all of them focus on genealogy – who begat whom – and not the adventure of their exploits." 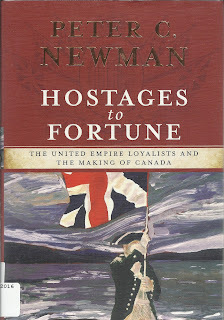 My prior comment: What has Newman read, or not read, amongst the Loyalist literature? "Almost all of them" are genealogical in nature? Whoa. Numerous historians (and genealogists) may disagree. New comment. Ironic, isn't it, that Newman chose to use a Jarvis family as his main device to tell the Loyalist saga? And it works, insofar as it goes. ► Quote: "The Loyalists were tortured and killed during the American War of Independence when the Americans turned on anyone loyal to the King. Tarring and feathering was the torture of choice, Newman said." My prior comment: "Loyalists were tortured and killed" — but hey, they did fight back and returned the favours. ► Quote: "A religious, self-effacing people, the Loyalists spurned the chest-thumping bravo of the Americans and developed styles and attitudes that are very much like the Canadian personality of today, he said." My prior comment: "Religious" and "self-effacing" are extremely broad, sweeping adjectives. No doubt many of them were perhaps one or the other, perhaps sometimes both at once. Were they more "religious" than their foe? What connotation does "self-effacing" conjure? ► "Instead of settling disputes with guns and violence, the Loyalists preferred to argue things out and reach a consensus, he said." My prior comment: As for "guns and violence," ask military historian Gavin Watt. Did the Loyalist corps not strive to give as good as they got? Or is Newman time-shifting several years down the road to political issues? New comment: Picky me. But when did the Loyalists do that amongst themselves, in matters that would incite impulsive others to weapons? During the war? In their refugee camps? On the evacuation ships? What kind of disputes is he referring to? Okay, okay, I will stop. Well, let's face it. An interview is not a book. The book. Newman succeeds again, in my opinion ... in a lightweight way, covering ground related many times before (familiar to Loyalist descendants). Although he extends his mandate to the War of 1812 and beyond, he includes little on Aboriginal resettlement apart from the expected Brant family mentions. And curiously, in a very large bibliography, how could merely one of Gavin Watt's books be present? He gets the job done, the tales told; his easily digestible manner will capture popular imagination, much like Historica Canada's Heritage Minutes. I look forward to potential book reviews by perhaps Mary Beacock Fryer UE or Peter Johnson UE.